Wharton Club Members invited to author discussion, Q&A, and book signing. Bret Baier, Chief Political Anchor for Fox News Channel and the Anchor and Executive Editor of Special Report with Bret Baier, will share his latest book, Three Days in Moscow: Ronald Reagan and the Fall of the Soviet Empire, at a National Press Club Headliners Book Event on Tuesday, May 29 at 7:30 p.m. in the club’s conference rooms. 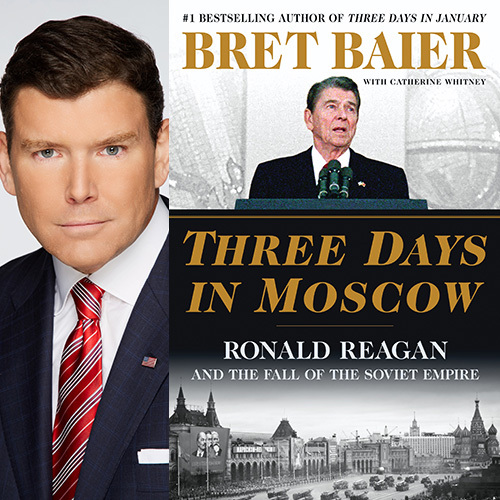 In Three Days in Moscow, Baier uses the 1988 Moscow Summit, President Reagan’s pivotal final meeting with Mikhail Gorbachev, to examine the life and legacy of President Reagan and his arduous battle with the Soviet Union through a new lens. This event will feature an author discussion, audience question-and-answer session, and book signing. Tickets are Complimentary for Wharton Club Lifetime and President's Club Members (you and a guest), 10/person for all other Wharton Club Members. Books can be purchased online at the same time as tickets or at the event. No outside books or memorabilia are permitted. Proceeds from this event benefit the non-profit affiliate of the Club, the National Press Club Journalism Institute, which offers innovative, practical training to journalists and communications professionals working in a rapidly-changing media environment. Bret Baier is the Chief Political Anchor for Fox News Channel and the Anchor and Executive Editor of Special Report with Bret Baier, seen five days a week on Fox News Channel. Baier has been with the network since 1998, and served as National Security Correspondent based at the Pentagon, before being named Chief White House Correspondent in 2006. Baier has reported from seventy-four countries over the course of his journalism career, including dozens of reports from Iraq and Afghanistan.